HEVC, short for High Efficiency Video Coding, is an successor to H.264/MPEG-4 AVC (Advanced Video Coding). Also know as H.265, HEVC is the latest video compression standard that is said to double the data compression ratio compared to H.264/AVC at the same level of video quality. Video encoded with HEVC will maintain the high visual quality, but at a smaller file size. Compared to the H.264/MPEG-4 AVC High profile, the average bitrate reduction for HEVC was 52% for 480p, 56% for 720p, 62% for 1080p, and 64% for 4K UHD. To improve the compatibility, a recommended solution is to convert HEVC file format to AVI, convert HEVC file format to MP4, convert HEVC file format to Webm, convert HEVC to MPEG, convert HEVC to WMV, convert HEVC to MP3, convert HEVC to WAV and etc. The following article will introduce a step by step guide on how to convert HEVC files to play HEVC files on PC and Mac with a nice HEVC File Converter and HEVC File Player. UFUSoft Total Video Converter, (For Mac User: Video Converter for Mac) the professional HEVC File Converter and HEVC File Player, can help convert HEVC files format to almost all the video and audio formats like AVI, MP4, WMV, WebM, MPEG, FLV, MKV, MOV, VOB, MP3, WAV, WMA, FLAC, etc on Windows and Mac with 30X fast speed and HD video quality. Besides, the nice HEVC Video Converter is a wonderful HEVC File Player that enables to freely play HEVC files without time and device limitation. The outstanding HEVC File Converter is a specially designed video editor. It can join HEVC files together, cut off the unwanted HEVC files, split HEVC files, crop HEVC files, adjust HEVC screen, add or remove watermark, add subtitles to HEVC files or remove subtitles to HEVC files, increase HEVC file quality, increase HEVC sound volume, adjust HEVC video or audio channel or codec, rotate HEVC files, compress HEVC files and more. Convert HEVC file format to AVI, MP4, WebM, MOV, WMV, MPG, MP3, WAV with HEVC to AVI Converter to play HEVC files on portable devices like Blackberry, PSP, PS3, Xbox 360, Creative Zen, Zune, Android, Samsung Galaxy, Google Nexus, Microsoft Surface, BlackBerry, Apple TV, PSP, PS3, Pocket PC, Creative Zen, Xbox, Archos and so on. Convert HEVC file format to MP4 or MP3 to with HEVC to MP4 Converter to play HEVC on Apple devices like iTunes, QuickTime, Apple TV, iPad, iPod, iPhone, Mac Book Pro, iMac and more. Convert HEVC files to AVI, WMV or MP4 to play HEVC files on kinds of media players including VLC, Windows Media Player, and more. Convert HEVC to MOV, MPEG or MP4 to import HEVC to iMovie, Adobe Premiere, Final Cut Express, Final Cut Pro, Windows Movie Maker, Sony Vegas, etc for editing. HEVC DVD – Convert HEVC files to VOB, burn HEVC files to DVDs. Convert HEVC videos to FLV, MPG, AVI or MP4 to upload HEVC to video sharing sites like YouTube, Facebook, eHow, Vimeo, Vimeo, BBC, Bing, Yahoo and more. Convert HEVC files to other video or audio formats like convert HEVC to MKV, VOB, Xvid, DivX, RM, F4V, Apple ProRes MOV, WebM, H.264, 3GP, VP8, AVCHD videos and more or convert HEVC files to MP3, WAV AAC, AC3, WMA, FLAC, OGG, AIFF, RU and etc. HEVC Player – Play HEVC videos easily and freely. HEVC File Converter for Windows can work with all Windows systems including Windows 10, Windows 8.1, Windows 8, Windows 7, Windows XP, Windows Vista, and Windows 2000. HEVC Converter for Mac is compatible with macOS 10.13 High Sierra, macOS 10.12 Sierra, Mac OS X 10.11 EI Capitan, Mac OS X 10.10 Yosemite, Mac OS X 10.9 (Mavericks), 10.8(OS X Mountain Lion), 10.7(OS X Lion), 10.6(Snow Leopard), 10.5(Leopard), Mac OS X 10.4(Tiger). How to Convert HEVC to AVI, MP4, WebM, MPEG, WMV, MP3, WAV for Playing with HEVC Converter? 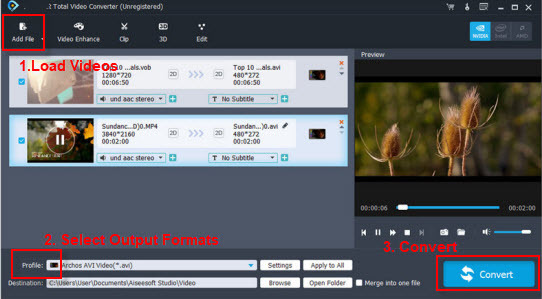 Just drag and drop HEVC videos to the interface of the HEVC converting software. You can also click the “Add File” or “Add Folder” button to add the HEVC files or folders to the software. Then you can preview your HEVC files. Go and find the “Profile” drop down button and set the video format you prefer. Go to the “Trim” window to cut HEVC files. Go to the “Crop” window to crop HEVC files or adjust HEVC screen. Go to the “Effect” window to add or remove watermark, add subtitles to HEVC files or remove subtitles to HEVC files. Go to the “Settings …” button to increase HEVC file quality, increase HEVC sound volume, adjust HEVC video or audio channel or codec, rotate HEVC files, compress HEVC files and more. Just one click on the “Convert” button to begin converting HEVC files. HEVC File Converter is the most professional and reliable HEVC Video Converter and HEVC File Player that enables to convert and play HEVC files on Mac and PC. Free download the wonderful HEVC File Converter as well as HEVC File Player to play HEVC videos with boundless fun right now.